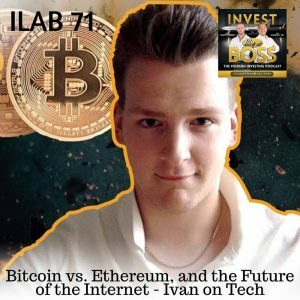 Ivan Liljeqvist is a software developer who is a leading expert in Blockchain Technology. He is the founder of Ivan on Tech, a YouTube channel featuring a series of videos explaining blockchain, cryptocurrencies, and the tech industry, in general, for the “non-techy” people to understand. On this episode, he explains the difference between Bitcoin and Ethereum. He also explains the foundations of Blockchain Technology, Decentralized Applications, and Cryptocurrencies. He shares his vision for the ICOs and the future of the Internet. If you are thinking about buying digital currencies, this is the episode for you. Listen to ILAB 71 on iTunes here or subscribe on your favorite podcast app. 8:17 – When and how did he learn about Cryptocurrencies? 9:38 – How much time does he spend learning Cryptocurrencies vs. other Tech works? 12:13 – Who is behind Ethereum? 19:19 – How was Ethereum created? 27:07 – Where can people buy Ether? 29:52 – Who is Satoshi Nakamoto?